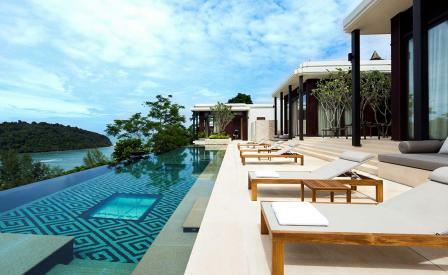 True hideaways are increasingly rare on the Thai island of Phuket. In between the pockets of lively bars, clubs and retail, resorts jostle for undisturbed stretches of land in amongst the din. Fortunately, the Anantara Layan Phuket Resort has managed to carve out a truly secluded spot on the island’s northwest coast. On the cusp of a national park forest and opening up onto a private beach, Anantara Layan presents a paradise in isolation. Just one of a small handful of properties in Phuket that actually sit on the beach, the Anantara plunges guests right in the heart of an idyllic landscape with a series of beachfront villas shaded by coconut trees and surrounded by white sand. All accommodations, a mixture of luxury rooms, suites and pool villas, blend contemporary design with a celebration of both the surrounding environment and local culture by way of exquisitely crafted wooden furniture, rich textiles and Thai artwork. For the converted, there’s the opportunity to own one of the 15 spectacular hillside residences- one of the last projects by Indonesian architect Jaya Ibrahim. Here, expansive windows, panoramic verandas and open rooftops give way to views of Layan Beach and the Andaman Sea. And while each of these havens have their own five-star facilities, residents still have access to the resort’s offerings, including the Anantara Spa. Certainly, a paradise within a paradise.